Now that we're in the new year and the winter period is nearly behind us, I thought I'd share with you my winter beauty essentials that I can't live without during this time of year. I don't normally tend to do posts like this because quite frankly essential products can tend to be pretty boring and no one wants to see my spotty face with dry patches all over it now do they, but hey ho .. I'm here today to share my favourite products to tackle the spots and keep my skin looking as fresh and healthy as possible. Sudocrem is one of my favourite beauty products. It may seem like a silly thing to call a favourite, but honestly it works wonders on my skin and can be used for so many different things! I usually use it to tame angry red spots on my face and it works an absolute treat. It's also great to be used as a face mask, something I like to do on those pamper days. It really helps to soothe my dry skin. Vaseline is another firm favourite of mine! Dry lips a big problem? Look no further! Got very dry skin? Vaseline is your answer! Honestly, it really is a massive saviour in my life. It works wonders and there are so many versions of it now you can even get tinted ones! Now you're probably thinking I'm a right weirdo saying that toothpaste is a beauty essential, and before you presume - it's not to be used on your teeth on this occasion! I use toothpaste when I have vigorous spots to calm the area and reduce redness. Once it's helped to dry the spot out that's when I will put my Sudocrem on! Dry shampoo is my best friend when my hair is greasy and looks a show. I don't know what I ever used to do without it to be honest. It's so amazing. It's good for greasy hair or adding much needed volume before a night out so it's basically a 2-in-1 product and is essential to own in the winter when you simply cannot be arsed to wash you hair or do anything with it! So there you have it. 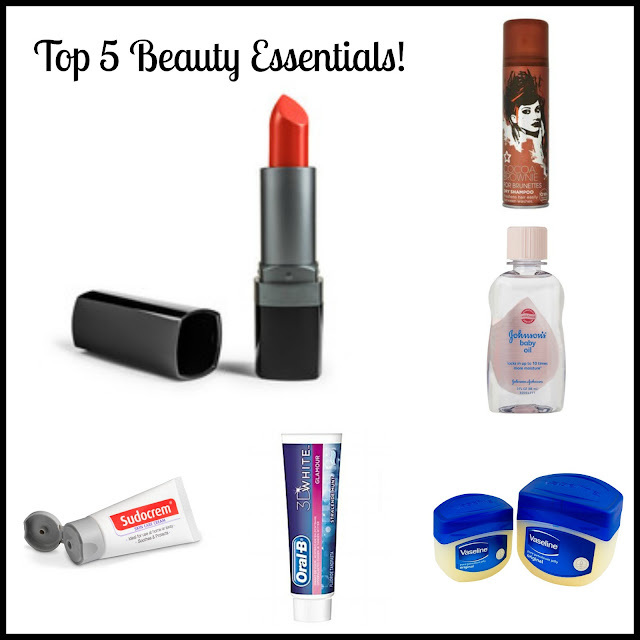 My top 5 beauty essentials. Let me know if you've got any recommendations in the comments below!